Another Gold award storage facility on the outskirts of Blackburn within easy reach of junction 3 & 4 of the M65 less than 1 mile away. 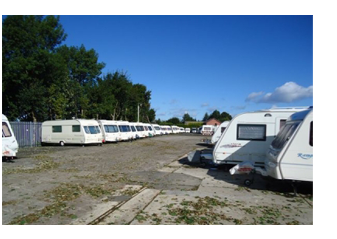 The proprietor has a wealth of experience in caravan storage with over 30 years knowledge. The site offers a very high level of security at an affordable fee. Leaving J3 of the M65 take Finnington Lane heading towards Blackburn. At the lights turn right onto Mouldon Brow. Turn right at A6062 Livesey Branch Road on the mini roundabout. At the next roundabout take the 3rd exit onto Horden Rake and after 100 yrds turn right onto Stockclough Lane. The site is the first left on the right hand side. The whole of the storage site and estate is tarmac or gravelled hard standing. Each Customer has their own numbered bay for their exclusive use. Entry times change when the clocks change so depending upon the time of year access is from 7am to 9pm in the summer and 7am to 8pm in winter. Bays are designed for easy access and are suitable for caravans under 4m up to 9m in length. Specialists in caravan storage, boat storage, motor-home storage and established for over twenty years we have taken the time to understand the needs of our customers. 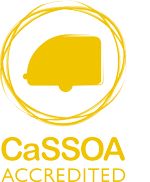 Because we are GOLD awarded by CaSSOA, you will eligible for cheaper insurance rates for your caravan or motor-home. We offer cost effective long and short term storage. Many insurance companies offer our customers discount on caravan insurance as we are a Gold Awarded company. We are committed to providing you with the peace of mind of secure caravan storage at great value prices ...and don't forget, many insurance companies will offer you up to a 25% discount if your caravan or motorhome is stored at our CaSSOA gold awarded storage site.